Pillsbury had had enough. It was 1964 and Kool-Aid had monopolized the powdered drink-mix market for at least 30 years. It was time for a marketing all-nighter. Making a similar product would be simple enough. No point in changing the actual mix, its flavor or the size of the package. No reason to change the way the product is used: empty the packet into a pitcher and add a couple of cups of sugar and 2 quarts of water for a sweet and slightly tart beverage that is cheaper than pop. No, keep that. What about the character associated with the product? Kool-Aid had the Kool-Aid Man, a lovable sweaty, pitcher-person full of red Kool-Aid. How could Pillsbury top that? How about giving each flavor its own character with wacky names like Loud Mouth Punch and Choo Choo Cherry? Also, why not blitz children's magazies with contests and offers for popular toys like Barbie and Major Matt Mason or for Funny Face premiums? Did it work? I don't know how the numbers played out. I'm sure that as long as the TV and magazine campaigns ran, Pillsbury certainly gave Kool-Aid a run for its money. Sure, Kool-Aid was no stranger to mail-aways and premiums, but I suspect the the chummy Kool-Aid Man was no match for the maniacal Funny Face characters nor was the plain orange flavor any competition for Jolly Olly Orange. The line ran out of gas in the last '70s, and was eventually sold to Brady Enterprises in 1980. The Kool-Aid Man had won. 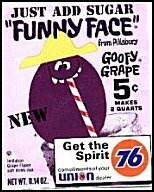 Today, both Kool-Aid and Funny Face premiums and mail-aways are very popular, but Goofy Grape and the gang have a special place in the hearts of collectors of baby-boomer memorabilia.